For years, South Mountain Community College, part of the Maricopa County Community College District in Arizona, had been using a commercial software solution to track data about its tutoring, supplemental instruction and workshops attended by students. But dissatisfied with the inflexibility and cost of the product, in February 2013 a team of developmental education faculty held a meeting with IT employees to consider the possibility of designing their own solution. "We just looked around and said, there are a lot of brains around this table," recalled Dawn Penich-Thacker, director of the writing center and tutoring partnerships. "Do you think there is another way to do this?" Part of the problem was that the commercial software was not well integrated with other campus systems such as the student information system. "Even a relatively young college like South Mountain has cobbled together different software systems and data warehouses," Penich-Thacker said, "and getting them to all communicate and keep up with the pace at which our data needs are changing is becoming difficult and at times expensive." With input from several areas of campus, the design team, led by programmer analyst Alan Ziv, created a Web-based application called the Learner Support System (LSS) that tracks students' usage of campus resources as well as key academic details such as with whom a student worked, how long he or she spent with a tutor, what the focus of the tutoring session was and how effective it was perceived to be. The system provides data at the individual student, course and program level to help inform institutional strategic planning and resource development. The summer 2013 introduction of the application coincided with a redesign of SMCC's tutoring process with an enhanced customer service focus, involving the use of iPads and processes designed for mobility, speed and convenience. Some of the tutoring spaces are large, with more than 100 students milling around. "In these larger spaces with only a few tutors working, previously it was impossible to have a good sense of who had been helped or where someone had moved to," Penich-Thacker explained. "We weren't able to provide the consistency and follow-through that we wanted. With the iPads and this system, the tutors walk around and check in on everyone and are able to make real-time notes about who has been helped and who is still waiting." Rey Rivera, SMCC's vice president of learning, said the LSS has become a valuable source or data for academic decision-makers. "Previously, we didn't have baseline data about the number of students we were serving. The LSS gave us that baseline," he said. "It told us which courses had the highest demand for tutoring services, which made it easy for us to show why we needed to dedicate college budget to tutoring, the writing center and computer commons." In fact, after the first year of the LSS implementation, SMCC compared LSS usage data to actual success (passing a class) and retention (staying in class the entire duration of the term) rates and discovered a substantial difference between students who logged three or more hours in the LSS vs. those who logged fewer. Based on that comparison, the developmental education faculty instituted a requirement for all developmental students to put in three hours of tutoring, study group, coaching or workshops in addition to class requirements. As a result, these courses have seen double-digit gains in retention and success of students overall, Rivera said. "When we saw the data, there was a pretty clear cutoff point that after three hours of tutoring or workshops, there was a significant increase in success and retention numbers," Rivera said. As Maricopa tracks districtwide metrics for developmental education, the LSS allows SMCC to more easily indicate what actions it is taking and what outcomes are happening as a result, he added. "This puts us on the map in terms of leadership of developmental education for our district." Penich-Thacker said that because the application was written in-house, SMCC has the flexibility to make changes based on faculty requests. "We can add options for how reports get generated and what they look like, all coming straight from instructors who say they would like to be able to sort data this way or that way." Since its development in summer 2013, the tracking system has expanded beyond the learning center and developmental education and is now used by federal grant programs such as Trio, specialized cohorts such as Athletics and Early College, as well as the Computer Commons and Entrepreneurship Center. 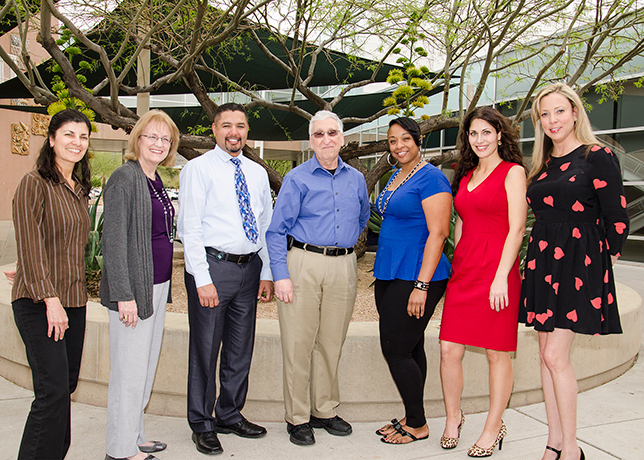 It also has started to spread to the nine other Maricopa County community colleges. "Four of our sister colleges have the system. Some are using the full-fledged application and others are making their own tweaks and are starting to implement it," said Penich-Thacker. "We have a value in our system called One Maricopa — we share good ideas. We wanted to do that from the get-go."